The most commonly used match in the industry is where every other leaf of veneer is turned over, like the pages of a book. Thus the grain is mirrored in each adjacent leaf. The visual effect created is that veneer joints match, creating a symmetrical pattern. This type of matching yields maximum continuity of grain. When sequenced panels are specified, prominent characteristics will "ascend"or "descend" across the match as the leaves progress from panel to panel. Book matching may be used with plain, quarter or rift sliced veneers. Because the "tight" and "loose" faces alternate in adjacent leaves, they reflect light and accept stain differently, and this may yield a noticeable color variation in some species or flitches. Often used with quarter sliced and rift sliced veneers, this is the process in which a sequence of matching veneer leaves or consecutive sheets of veneer are slipped out one after the next, to form the face of a panel product. This results in all the same face sides being exposed. The visual effect shows a grain figure repeating, but joints do not show grain match. The lack of grain match at the joints with slip matching can be desirable. The relatively straight grain patterns of quartered and rift veneer generally produce pleasing results and a uniformity of color because all faces have the same light refraction. This is in contrast to book matching where alternating leaves are turned over. In reverse slip matching the veneer leaves are slipped out from under each other and every other veneer leaf is lipped end to end. This balances the character of the veneer in the panel face. This if often used in boat shaped ables or other areas where round or curved shapes would otherwise be cutting off the grain in peculiar ways. One leaf is spliced end to end with another leaf to create a longer panel or piece of veneer. 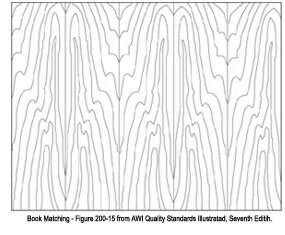 End matching is often sed to extend the apparent length of available veneers for high wall panels and long conference tables. End matching occurs in two types: Architectural end matching, where leaves are individually book (or slip) matched, first end-to-end and then side-to-side, alternating end and side. This produces the best continuous grain patterns for length as well as width. The second end match is Panel End Match, where leaves are book or slip matched on panel sub-assemblies, with sequenced sub-assemblies end matched, resulting in some modest cost savings on projects where applicable. For most species, Panel End Match yields pleasing blended appearance and grain continuity. Veneer leaves are placed next to each other in a random order and orientation and randomly spliced edge to edge, producing a "board-by-board" effect in many species. This produces a casual or rustic appearance, as though individual boards from a random pile were applied to the product. Conscious effort is made to mismatch grain at joints. Degrees of contrast and variation may change from panel to panel. This match is more difficult to obtain than Book or Slip Match, and must be clearly specified and detailed.